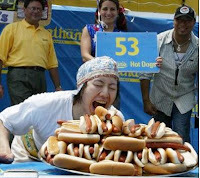 There are many possibilities with eating contests. You can have contestants eat pies, cabbages, celery sticks, watermelons, and so on. You can have them use their hands or not. You can either judge on speed or least amount of bites. It has been recommended that you visit the foreign foods section of your local grocery store also.